An Oracle Cluster Domain is a choice of deployment architecture for new clusters, introduced in Oracle Clusterware 12c Release 2. Oracle Cluster Domain enables you to standardize, centralize, and optimize your Oracle Real Application Clusters (Oracle RAC) deployment for the private database cloud. Multiple cluster configurations are grouped under an Oracle Cluster Domain for management purposes and make use of shared services available within that Oracle Cluster Domain. The cluster configurations within that Oracle Cluster Domain include Oracle Domain Services Cluster and Oracle Member Clusters. An optional Rapid Home Provisioning (RHP) Service to install clusters, and provision, patch, and upgrade Oracle Grid Infrastructure and Oracle Database homes. When you configure the Oracle Domain Services Cluster, you can also choose to configure the Rapid Home Provisioning Server. 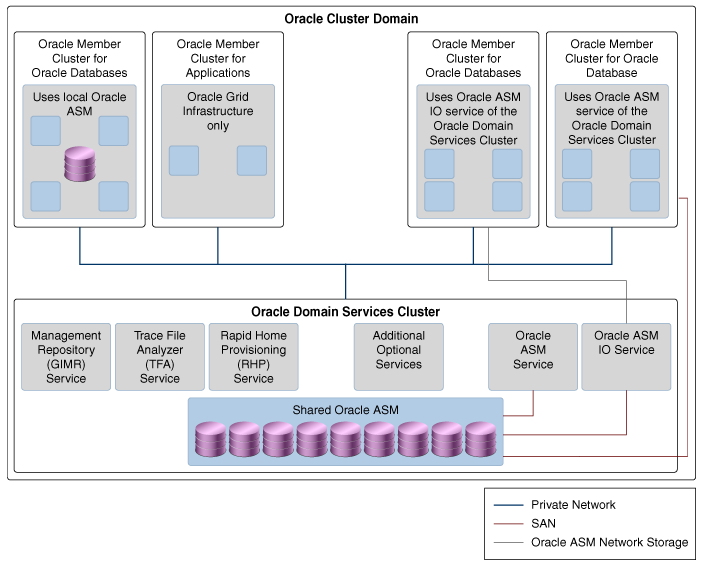 An Oracle Domain Services Cluster provides these centralized services to Oracle Member Clusters. Oracle Member Clusters use these services for centralized management and to reduce their local resource usage.